Spiceology's Gail Golden likes to tell the story about how her boss, Spiceology founder Pete Taylor, walked into a Williams Sonoma store saying that someday his products would be on the shelves. And how when Williams Sonoma called to inquire about Spiceology products, Taylor's business partner, Heather Scholten, wondered if someone was having a laugh at their expense. Fast forward seven years, and not only does the high-end food and lifestyle retailer carry a four-pack of Spiceology-branded rubs, it will soon carry three popcorn flavorings Golden and Scholten created especially for musician Questlove, aka Ahmir Khalib Thompson. Questlove is the drummer and frontman of The Roots, the in-house band for The Tonight Show Starring Jimmy Fallon. He also knows a thing or two about food, having written the James Beard-nominated Something to Food About, featuring 10 conversations with chefs about creativity and what inspires their work. Spiceology got the opportunity to develop Questlove's project because of their prior experience with both popcorn seasonings — their Black and Bleu rub is popular — and Williams Sonoma, says Golden, who utilizes the company's well-stocked test kitchen inside their Sprague Avenue facility. "Private label projects are those we do for other companies and therefore do not have our brand named anywhere," explains Golden, who is director of private label development at the Spokane-based company. 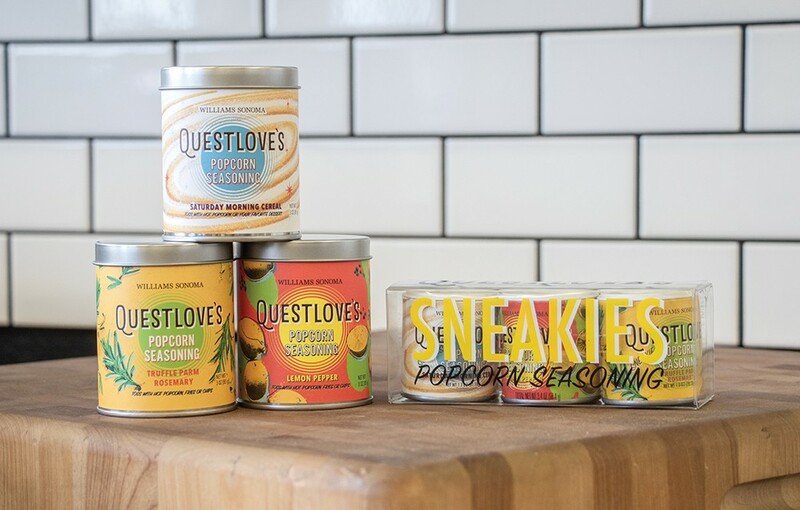 An avowed foodie, Questlove provided specific flavor profiles he wanted in the popcorn seasoning that would bear his name: a lemony-pepper seasoning similar to Wingstop chicken wings, a cinnamon toast flavor he calls "Saturday Morning Cereal," and a savory rosemary truffle parmesan. The resulting three-pack is called Sneakies and reflects the singer's fondness for popcorn — the song "Pass the Popcorn" is included on his Organix album. "This was a fun project and pulled me out of my comfort zone," says Golden. "Seeing [Questlove] on the Rachel Ray show holding my product... it was incredible." Even though she can't talk about their current private label development plans, Golden says she knows exactly which musician she'd like to work with given the opportunity: Dave Grohl of the Foo Fighters. "It would be absolutely something spicy and adventurous," she says. The original print version of this article was headlined "Popcorn Quest"